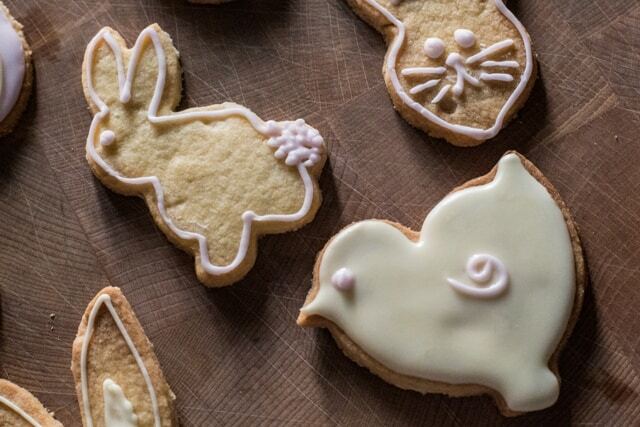 I originally published this recipe for Dairy Free Easter Cookies back in 2015. I’ve made the dairy free cookie dough several times since as it’s so easy and SO tasty. I really recommend this dairy free cookie recipe next time you need to cater for a lactose intolerant child or friend. 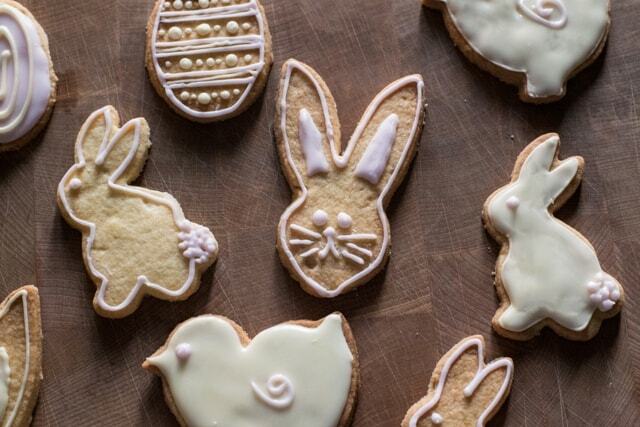 Obviously you can swap out the Easter cookie cutters for any shape you fancy! If you do give them a go, please be sure to tag me in any pics you share online as I love looking at all your recreations of my recipes! We’re off on our annual camping trip at Easter, spending the long weekend in 100 acres of gorgeous Cornish woodland with loads of friends, campfires and cider at the Cornwall RV. I can’t wait. I look forward to this bash all year long. In celebration of the fact it’s nearly camping time (woohoo! ), I baked you some cookies. I do hope you’ve not getting bored of my cookies yet, cos I am discovering my latest guilty pleasure is zoning out with icing bag in hand. That’s by far my favourite part of baking them. I have to set aside an hour or two to make the icing and do the decorating and during that time there is absolutely zilch on my mind apart from sugar. It’s way cheaper than therapy, although admittedly a tad more fattening. You can find more of my cookie obsession here with this tasty gluten free cookie recipe, and these adorable chocolate dairy free cookies. And being lactose intolerant myself, I have a whole dairy free recipes category, and if you’re new to the dairy free life, here’s a tonne more dairy free inspiration. Preheat the oven to 170/325/gas 3. In a mixing bowl combine the sugar and softened coconut oil until it is smooth. Add the egg, and again mix well until all is combined. Squish & squash the dough into a ball, wrap in cling film and pop in the fridge for an hour or two to firm the dough up. Lightly flour the work surface and roll out half the dough with a rolling pin until it's about 1/4 of an inch thick. Cut out cookie shapes with cutters or by hand using a small sharp knife and place each cookie onto an ungreased baking sheet. Bake for 12-15 minutes and take out just before they get brown. 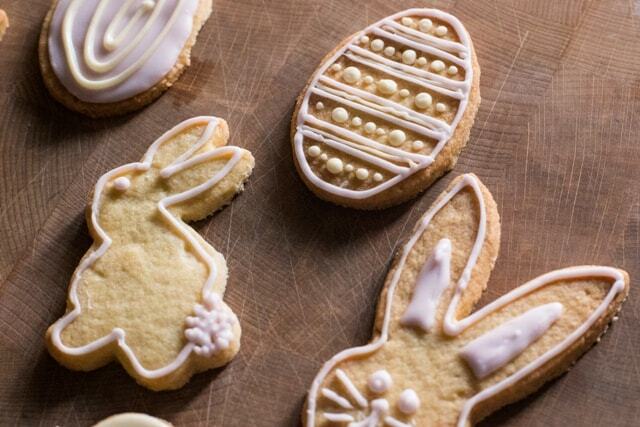 Use a fish slice or palette knife to move each cookie onto a cool flat surface. Mix the egg white and icing sugar together until you have a glossy, smooth mix. Either keep white or add some food colouring a drop at a time. I put half my icing into another bowl and used just a couple of drops of pink and yellow in each bowl to create a soft, pastel shade. When it is the colour you like, scrape the icing into icing bags and get decorating! These are really cute, such lovely decoration and shapes..would be fun to make these!! Darling, darling!!!! I love everything about this recipe from the coconut oil to your final creations. These are so cute Jane. Love that they are dairy free! I LOVE these! Do you remember where your bunny cutter was from? These are so adorable!! They look like they would be so much fun to make! Sending some foodie love your way! Lovely to meet you Michelle and thank you for popping in! These look amazing I am going to book mark them for my friend. Cute holiday cookies are my thing, I can’t get enough, now I just need to find those adorable cutters! they look great! 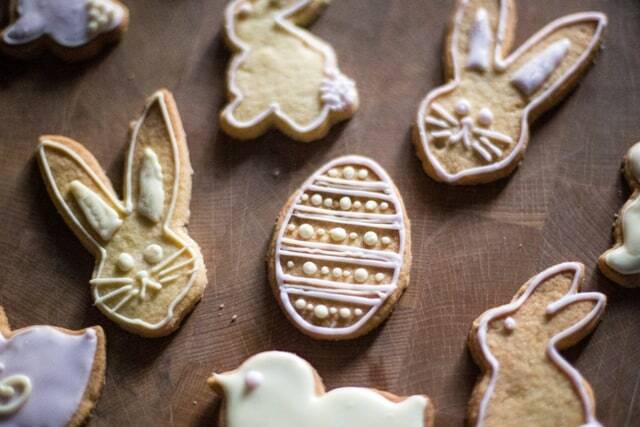 I’, always on a look out for a new cookies recipe, and this one will be perfect, with Easter just around the corner! Great fun to make with kids too!